The newly revamped Firing Line on PBS has in common with other TV and movie “reboots” the benefit of a familiar name and the burden of meeting expectations. Sadly, the new show, hosted by political commentator Margaret Hoover, is more hampered than helped by its association with the original. The first thing you want to know about a relaunched Firing Line is who will take the place of William F Buckley in the interviewer’s chair. The choice of Ms Hoover – an anti-Trump moderate Republican – is interesting, and not just for the thrill of having a “female Bond”, (or should that be “Bond villain”..?). The two qualities which made William F Buckley so formidable a host of Firing Line were 1. a strong political worldview, which put him at odds with guests of both left and right, and 2. the dialectical skill to interrogate his guests’ ideas, and to do so from this perspective, even when playing the devil’s advocate. The resulting pleasure was to see famous people with noisy opinions, and high ones of themselves, forced to justify their most basic assumptions, (often the hardest thing to do), and given all the time and space they need to hang themselves – having been led to the noose by Buckley’s forensic questioning. 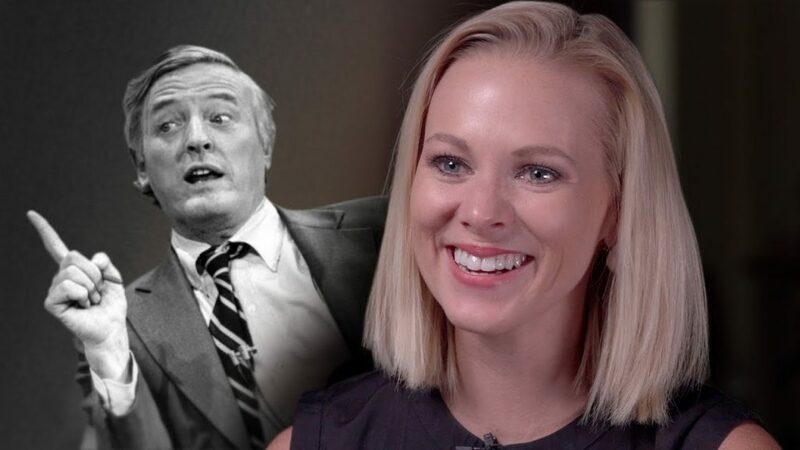 The drama came (or comes, now that the Hoover Institution – named after Margaret Hoover’s great-grandfather, President Herbert Hoover – has uploaded many of the old shows onto YouTube) from the sense of fierce intellectual combat being waged beneath the polite discussion. The new show has none of this subterranean warfare, consisting instead of a friendly and even supportive chit-chat among interesting people. While billing itself as “a contest of ideas”, the show suffers from Ms Hoover’s search for consensus when she should be looking for divisions, and fails to apply the elementary tools of cross-examination. For example, she lets Speaker Paul Ryan claim the 1996 welfare reform bill has been a great success, rather than a disaster for the poor single mothers left destitute after being stripped of their “government handouts”. The only hint of a pointed question was when Alexandria Ocasio-Cortez was asked about her public views on Israel, (“You used the term ‘the occupation of Palestine’. What did you mean by that?”). But after Ms Ocasio-Cortez proved and admitted that she didn’t know what she was talking about, the moment was immediately undercut by Ms Hoover, who praised her guest’s “honesty” and reassured her of there being plenty of time to learn once she enters Congress! And this was after Ms Hoover had let her guest breezily predict the end of capitalism without a real follow-up. There’s no reason these problems can’t be addressed, either by some sharper questions, or perhaps by having two guests on who are likely to disagree. To its credit, the programme has resisted the siren call of an “interactive” approach, with questions sent in live from Twitter and all the rest of it. But one rather misses the studio audience, even though they did little on the old show beyond the occasional chuckle, since people speak and behave differently when they’re in front of a crowd.